Here is the final result of our staircase make-over. From the living and dining room, the biggest improvement is that you can't see the staircase anymore. Or at least it is optional by way of our pocket doors. Our living room grew quite a bit by getting the stairs out of the room. Visually, they were stealing a lot of the attention and not in the best way. We pushed the stair case back by about two feet and then had room to turn the bottom of it so that it now goes into the downstairs hallway instead. Here it is from the other side. Before and after. You can see how the walls are now squared off. The octagonal ceiling shape is gone. No more beam. No 7 different ceiling heights in the kitchen. It's cleaner. Calmer. I love the look of the stairs from the hallway too. I put up a little gallery wall and a bench below. Oh check out the picture on the lower right. It's a picture of Dh pushing B on a cart through the warehouse at IKEA. Everyone has a picture of that on their gallery wall, right? This one is filed under "humor in decorating". And finally the staircase as you see it from across the hall. The ceiling height above the fourth step has been taken up by 6 inches, so no one is bonking their head coming up or down anymore like on the old staircase. The full slab oak threads are stained with Varathane's dark walnut. The floors are hand scraped natural acacia hardwood floors. 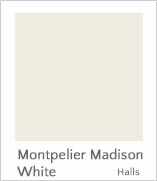 Montpelier Madison White is closest the Valspar match. 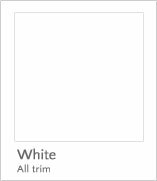 The color was matched to the curtains in living/dining room, then lightened with white. This article: Our new staircase - the reveal first appeared on http://ahomefordesign.com.